Pork shanks, which come from the front leg of the pig, are cheap cuts and if cooked properly, they can yield a delicious meal, as they become succulent and flavorful. This dish is inspired by a traditional Greek recipe of pork with celery root. 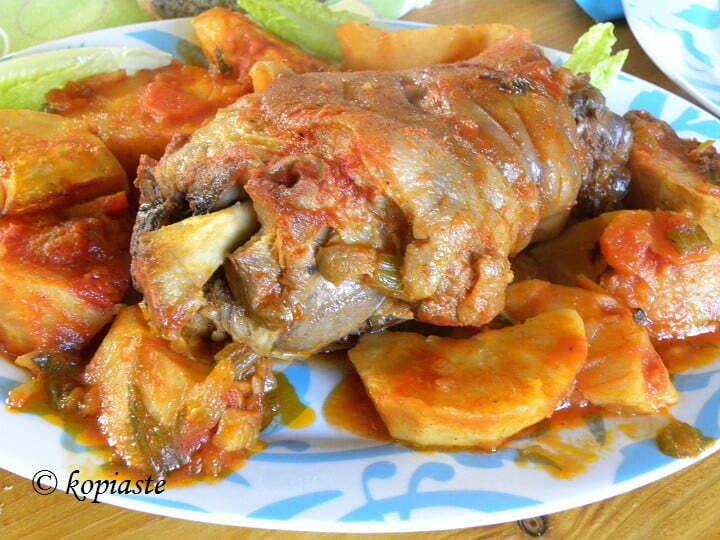 However, I made it using pork shank and beer which is quite different from the traditional recipe. Scorch the pork shank (if it has hair on the skin). Wash and pat dry. Heat the olive oil in a skillet and sauté on all sides until browned, about ten minutes. Add the beer and let it boil for a few minutes. Remove to a casserole with all the juices. Wipe the frying pan and add the remaining olive oil. Sauté the onion until translucent. Add the garlic and sauté for a few seconds. Add the carrots, celery, celery root, salt and pepper, bay leaf, tomato paste, tomato juice as well as all the beer from the casserole and bring to a boil. Simmer for five minutes. Pour all the ingredients over the shank, cover with the lid and bake in a preheated oven to 160oC for 2 hours and 30 minutes, or until the meat is tender. Serve the pork with the celery root and sauce.